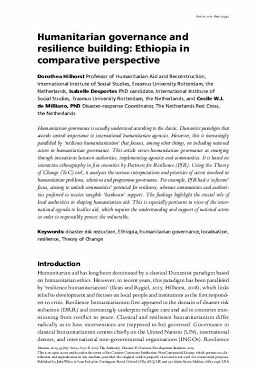 Humanitarian governance is usually understood according to the classic, Dunantist paradigm that accords central importance to international humanitarian agencies. However, this is increasingly paralleled by ‘resilience humanitarianism’ that focuses, among other things, on including national actors in humanitarian governance. This article views humanitarian governance as emerging through interactions between authorities, implementing agencies and communities. It is based on interactive ethnography in five countries by Partners for Resilience (PfR). Using the Theory of Change (ToC) tool, it analyses the various interpretations and priorities of actors involved in humanitarian problems, solutions and programme governance. For example, PfR had a ‘software’ focus, aiming to unlock communities’ potential for resilience, whereas communities and authorities preferred to receive tangible ‘hardware’ support. The findings highlight the crucial role of local authorities in shaping humanitarian aid. This is especially pertinent in view of the international agenda to localise aid, which requires the understanding and support of national actors in order to responsibly protect the vulnerable.